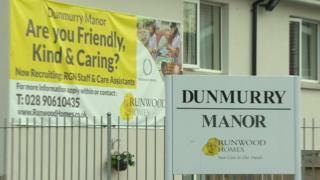 The PSNI will contact approximately 180 families as part of their ongoing criminal investigation into allegations of mistreatment at Dunmurry Manor Care Home. The home is located on the outskirts of west Belfast. It came under scrutiny following the publication of a damning report in June from the Commissioner for Older People in Northern Ireland (COPNI). The report outlined inhumane and degrading treatment of residents. Investigating officers have written to 70 families so far who had loved ones living in the home between June 2014 and July 2017. Contact was made with relatives two weeks ago. Some residents may have since died or been moved to other residential/nursing accommodation. In the letters the next of kin are invited to come and speak to investigating officers especially if they have concerns over the care and treatment of a family member. While extending the timescale is normal in a police investigation, it also indicates that the police are taking very seriously any leads they have been given by other families and staff.